This was a difficult block for me to do as I didn't particularly like the naked block. The only starting point I had was the remnant of linen doily with the tatted edge and motif. By taking one seam at a time the block gradually took on a life of it's own and now that it is done, I like it. 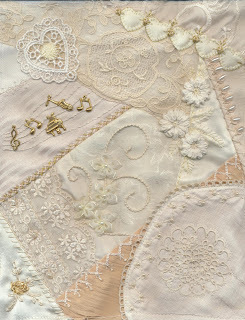 My favourite element of this block is the three antique ribbon flowers on the right hand side although the lace with the beaded edging at the lower left side is a piece from my Wedding dress so I guess that is a favourite too. 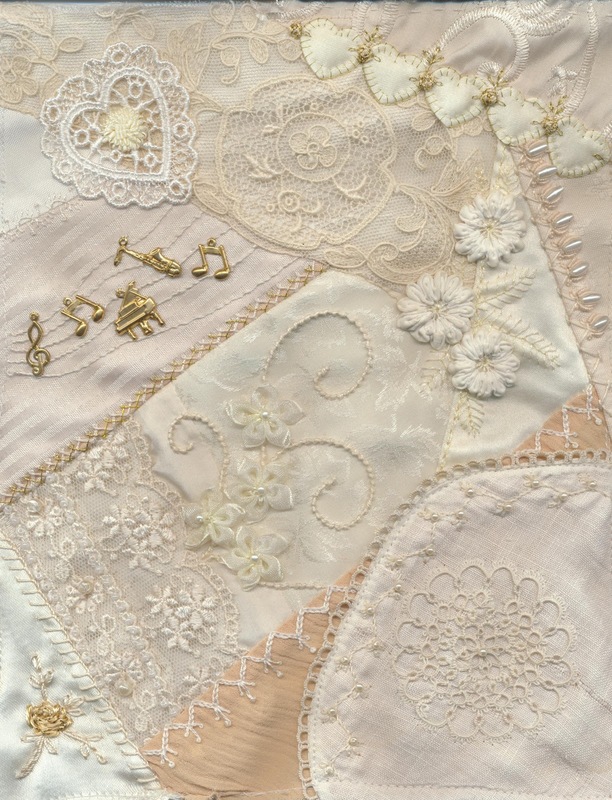 I think I also like the heart edging top right and then those charms add to the lovely laces and embroidery. You are doing a SMASHING job on these blocks and I can't wait to see this totally finished!!! Tis gorgeous, Vivienne!! Soooo very elegant! Viv, these blocks are just stunning!